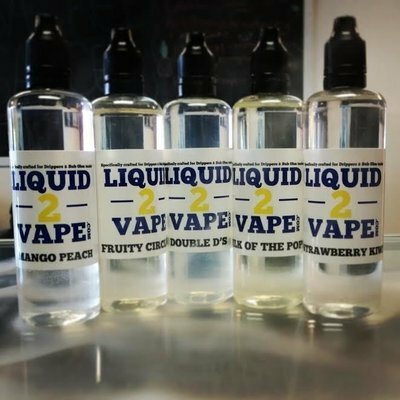 ALL OF OUR ELIQUIDS ARE MADE IN A FDA REGISTERED LIQUID MANUFACTURING FACILITY THAT IS CERTIFIED BY THE AMERICAN ELIQUID MANUFACTURING STANDARDS ASSOCIATION (AEMSA). As of January 1st, 2018 we offer all of our juices (except 500, & gallons) in Chubby Gorilla bottles and we now only offer bottle sizes of 15ml, 30ml, 60ml, 100ml, 120ml, 200ml, 500ml and now also in gallons. We also are now offering nicotine is strengths from 0mg to 18mg. Looking for something over 18mg? Check out our No Leaf Salt line! Once again we thank you for buying our juice! Because of you we have gone from being a "HOUSE BRAND" to a brand that is available for sale in over 200 vape shops in the United States, Canada and England. If you are a vape shop or distributor looking to carry our juices please email the owner directly at Larry@noleafvapor.com!